Until now I have been paying close attention to our faces in the Autumn Skin Series, which you might think is somewhat unjust – yes, we all look at our faces in the mirror but it is our bodies that carry us through every day, so choosing Bodhi & Birch Bath & Shower Therapy has been an obvious choice for me to talk to you about. My regular readers probably know that Bodhi & Birch founder Elijah Choo happens to be my dear friend, but my admiration of him stems from the fact that he cares deeply about his customers and creates products that nurture the skin and the senses, helping you feel energised or relaxed, depending on what is necessary for you in a moment in time. Whether you prefer showers or baths Bodhi & Birch products will become your perfect indulgence. If you wake up with a foggy head or need to wash off the sweat after the gym workout, then give Siam Ginger a try. It was developed to ‘invigorate & revive body and mind with uplifting fusion of ‘gingerly Galangal Root, sharp Cardamom & fresh Kaffir Lime Leaf. When developing this particular product Elijah drew on his knowledge of ancient remedies from the Far East and tried to create a sense of home spa that you can experience every time you take a shower ( whether in the gym or in the privacy of you own bathroom ) or bath. I love cooking with ginger and spices but to feel the energy of those on your skin is quite something else ( in addition to coconut oil and fruit sugars you also have grapefruit peel, turmeric root, Virginia Cedar Wood & spearmint leaf oils ) to fortify your skin ). Apply a few pumps to your hand or loofah and massage all over your body, taking deep, full breaths, inhaling the aromas that the steam of bath or shower magnifies and be transported to far away lands of immense beauty. If your muscles are tired or achy, put a few cupfuls into the running water and enjoy a long bath ( just make sure the water is warm and not hot). Taking a bath is always wonderful but don’t do it too often as it can dry your skin during the colder months when your skin needs the extra moisture. To me Siam Ginger smells of warm coca-cola and happiness of the sun on the skin but do let me know if you come up with your own description of it, if you have already tried this particular Bodhi & Birch product or will do so in the future. 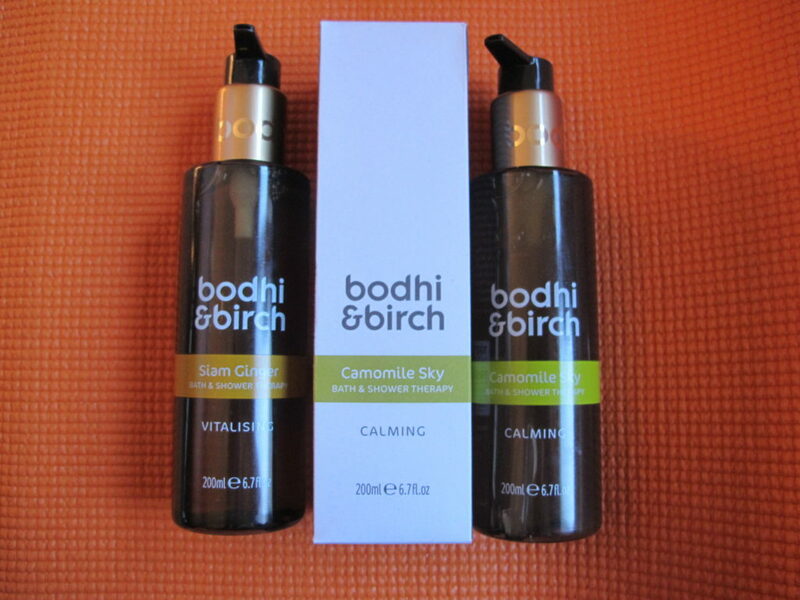 Another of Bodhi & Birch recent launches is the beautifully named Camomile Sky and when I first heard the name from Elijah, while talking to him on the phone, I simply started grinning. The name alone makes you feel dreamy, does’t it? And if you dream , you let your mind wonder and be free, thus unleashing your creativity. As the name suggest, Camomile Sky was created to ‘capture a sense of calm and purity with a fresh floral blend of delicate Camomile, sugared Hyacinth and blushed Geranium‘. The first time I tried this product I pumped a little of it on my dry hand and massaged it gently all over, watching it transform into a lightly milky, creamy consistency before I washed its sweetness off to reveal skin so soft to the touch, I skipped applying a body moisturiser ( there is Indian Rosewood, Valerian Root, Neroli Flower & Peru Balsam Oils in this formula ). Imagine ‘a drift of powdery air filled with sweet florals and the comforting warmth of soft honeyed musk’ – that is Elijah’s description of the product and I can’t word it better than that. I can just add that every time I use it in the evening I end up feeling serenely calm even before I light a candle and meditate. There is inner contentment and peacefulness that this product imparts on your skin and your senses and what better way to get rid of the stresses or frustrations of the day? Water is known to refresh and wash away the negativity and combining Camomile Sky with it makes for a beautiful unseen armour that protects you from turmoil by uplifting your senses and calming them at the same time. As Bodhi & Birch contain essential oils do a skin patch test 24 hours before use, if using the products for the first time. Once opened best used within six months. Bodhi & Birch products are made in England and are free from petrochemicals, parabens, phthalates, sulphates, DEA, TEA, PEG, Glycols, Silicones, Synthetic colours or fragrances, palm oil or animal ingredients ).